The original (over 35 years of experience) Evacuation Chair manufactured by Evac+Chair® of North America, was inducted (placed) in the World Trade Center Museum, on display for saving the lives of several individuals that were confined to a wheelchair during 9/11. Evac+Chair® of North America is now part of American history for saving lives during the World Trade Center Attack in New York City. The Stair Chairs of Evac+Chair® are of unique construction which makes it easy for anyone with any type of impaired mobility (permanent and/or temporary) to be navigated up and/or down a staircase in time of need. 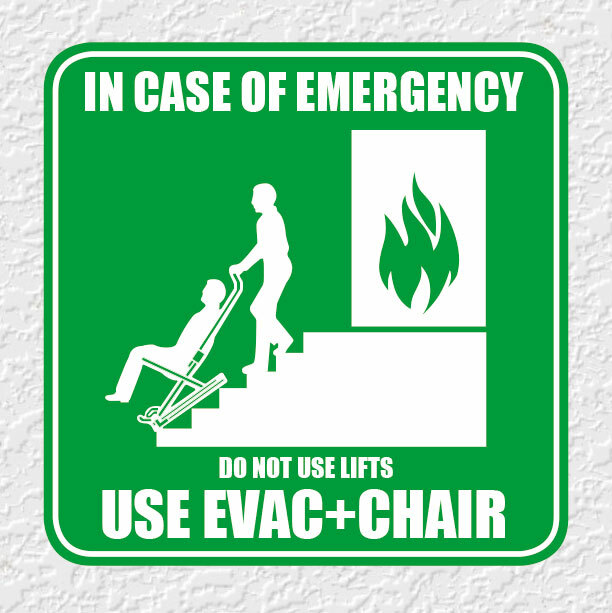 Evac+Chair® of North America is the company that originated the stairway evacuation chair over 30 years ago. 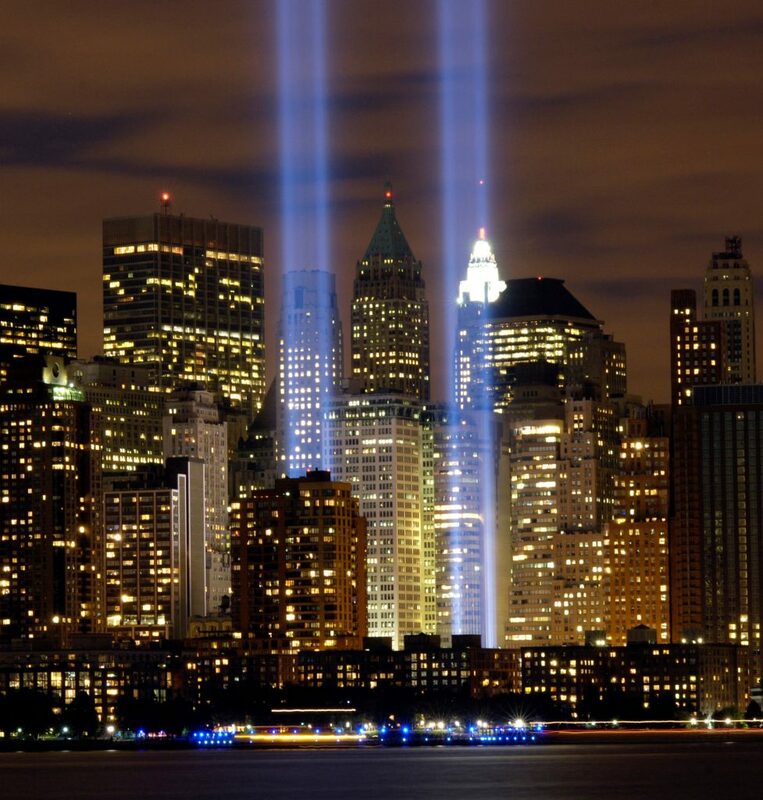 More than six occupants were rescued to safety during the World Trade Center Towers attack on September 11, using the evacuation chairs of Evac+Chair® of North America. "EVAC+CHAIR®: Designing a Lifeboat for Skyscrapers"
Prominently posted in all hotels and office buildings are bold pictographs showing a silhouetted man fleeing down stairs, warning: “In case of fire, do not use elevators. Use stairway.” The warning results from numerous tragedies and is based on well-documented evidence. In sealed windowed, multi-story buildings, elevator shafts can become gigantic chimney, sucking smoke and heat in and up. Three of the MGM Grand Hotel’s elevators jammed in the shafts because heat had melted the hoist cables. In many buildings elevators are equipped with heat-sensing devices that cause some of them to stop on floors where there are fires. Water from fire hoses can also short-out the electrical system and strand the cab between floors. Walk-down evacuations seemed a reasonable enough procedure to me until 1980. That was when my wife, a victim of childhood polio, was forced to evacuate her 38th floor office. Only the good fortune of a false alarm and a faithful relay of fellow office workers enabled her to escape, still very slowly and with great difficulty. Disabled veterans, executives with a history of heart trouble, sufferers from asthma or emphysema, or even recent casualties of the skiing season chance the same double jeopardy: if the emergency doesn’t harm you, there’s a good possibility the escape will. Government statistics show that disabled people are no small minority. More than 9.4 percent of the white collar labor force has a chronic physical disability. An additional 12.5 million Americans are temporarily disabled each year. Sixty percent of all pregnant working women work in their last trimester when their balance and mobility is often impaired. Finally, the working population continues to grow older. Despite these statistics, such people who either cannot or should not walk down stairs are advised to make a pell-mell attempt to do just that! My close brush with personal tragedy during my wife’s forced evacuation sparked my desire to seek a better solution. I found that no options for the disabled existed except for traditional versions of the two-man hand carry, all slow, dangerous and strenuous. What follows is the story of the dogged development of an invention. I believe it reaffirms the chess master’s dictum that the winning combination of moves comes to the player who best positions himself to a stage where these can develop…the “prepared mind” concept paraphrased. I began with a chair configuration and ended with a hybrid of stretcher, cart and chair. The stretcher is a well-accepted first-aid tool, but not very practical for the narrow turnings and precarious gradients of fire stairs. Moreover, even if some adaptation of the ski patrol toboggan-type stretcher could be worked out, I could not image the typical ambulatory office worker test riding such a prone descent. But there were two extraordinarily valuable ideas hidden in this stretcher application that set goals of performance for me. One, the evacuee’s weight should be carried directly by the stairs, not by human muscle. Two, the device should slide over at least two stair nosings at a time to provide a smooth passage over the stairs. Implied in this thought process was a very important, basic assumption. I was designing a universally usable, adaptable and completely portable evacuation unit requiring no installation. I also accepted evacuation of high-rise buildings as primarily a downward-directed activity. Many see the EVAC+CHAIR® as an adaptation of the familiar tractor hand truck used to deliver refrigerators and other heavy appliances up or down stairs. It’s a comforting analogy and may have been a more logical point from which to start but it was in fact not self-evident at the start. The typical refrigerator hand truck is designed to go up as well as down. To do so with minimum effort, crawler belts run over roller bearings to reduce friction. These carts, built to transport heavy, bulk goods, are deigned to be handled one step at a time, using first the crawler and then the wheels on alternating stair nosing and tread. The realization of these limitations became extremely important as you shall see. The hybrid was slow in developing. Starting with a stick chair profile and deferring a decision on the precise method of traction (I had a friction slide or belted traction carriage vaguely in mind), I began building half-scale models of various methods to extend the forward legs of a “chair” to accommodate all angles of descent. Research on architectural standards for public fire stairs showed these to be within a manageable range. But it soon became apparent that the resultant perch high off the stairs would be a shaky, dangerous platform form which to control one’s own descent. The safety of a buddy system would have to be employed. While experimenting with the unpromising extended-leg design, I realized that some form of shock absorber was needed in its rear to avoid the jarring bump when the chair moved from the last stair to the landing. A leaf spring or an appropriately angled extension of the stair traction carriage would ease the rear of the chair to the stair landing. The rear most appendage, if a belted surface, would cross the steps by itself!.. If I eliminated the front legs of the chair, added two wheels and set the rear belted carriages to the wheels’ tangent, the unit would – so to speak – slide down on its backside! Here was the major break I needed. Having developed the criteria – gravity driven, buddy guided, weight bearing directly to the steps, down evacuation only and seated evacuation – I now had found the geometry that could meet the criteria. Today, the most common reaction to an EVAC+CHAIR® demonstration ride is amazed wonder at its ease of operation, smoothness an speed. While under full control of the buddy or attendant, the descent is four times faster, safety and far easier than any other form of stairway carry. Controlling this descent was the second important breakthrough in its design. I had stared my design process with a misconception of what the endless traction belt should do. As a result, I first employed roller bearings in its support to lessen friction, as if I planned to evacuation upward. As soon as I discarded this needless complication, I was prepared for an important discovery which riding the escalator of a New York City department store. On that ride, I watched the rubber handholds slide smoothly over the side railing. If I could turn that railing upside down, I would have a rubber-grip outer surface, a linear friction brake interface between rubber and metal and the prerequisite longitudinal backbone to support the belt loop. There only remained the laborious trial-and-error testing and selection of the best belting material. After trying scores of materials and cross sections, including urethane, nitrile, gum rubber, rough tops, cleats, and so on, I finally selected an especially modified Gates FHP V-belt with the outside cover scarfed to provide an impression grip of each stair’s nosing. It has proved ideal for the purpose. Now trademarked Polymatic Traction, the interface of the endless belting to the rear carriages is a unique feature of EVAC+CHAIR®. Its smooth braking and traction system slows descent proportionally to the weight of the passenger. In effect, it allows gravity and friction to do most of the work. With the final addition of an extension handle (Figure #5) enabling the attendant to easily grip and guide the unit from the stairs immediately above the passenger, the device now worked in prototype. What remained to be done were those important, time-consuming details that changed a workable concept into a marketable commodity. In this detailing, I strove always to have each element serve two or more functions, thereby forcing the simplicity of design needed in any device meant for emergency service. Illustrative of this work was the development of EVAC+CHAIR’s® seat. Anthropometric data showed that a 250-pound working capacity would encompass 99 percent of the population and a seat hip clearance of 17.1 inches would accommodate at least 95 percent. By draping fire-retardant, 18-ounce vinyl-covered nylon in a sling seat rather than the originally planned two-piece seat common to director’s chairs, I lowered significantly the center of gravity, important to the passenger’s sense of security. In addition, unlimited hip room was provided with the open sides below the seat tubing and the passenger’s weight was further distributed between the seat tubing and that of the main frame cross member. The wire rope cable supports, while functional, are now redundant and retained primarily for physiological reasons. When opened, the pivotal U-frame seat, with its mechanical slides joining with the belted rear carriage extrusions, automatically positions the back channels to a precise angle for descent. At the same time, this cantilevered seat transforms the unit into a solid structural construction with the seat’s rear side tubes doubling as leg supports. The EVAC+CHAIR® Emergency Wheelchair was first introduced nationally at the 1982 Spring conference of the President’s Committee for the Employment of the Handicap. First, make sure it’s light, strong and simple to operate. Superfluous braking systems, overweight construction and multiple parts lists do not make an emergency tool that can be counted on. Weight and complexity are to be avoided. Let’s face it, evacuation equipment may well need to be carried to where it’s needed most. Up a flight of stairs, down the hall to a bedroom, to an accessible fire stair…it’s difficult to position equipment precisely where it will be needed. Therefore be sure it’s light enough to be carried. Twenty pounds is doable, 50-lbs is an arm-wrenching struggle. An added benefit here is that “light” translates into “speed” for getting it to where it’s needed. Evacuating an individual down fire stairs requires “control descent” that encourages speed to match traffic flow. “Polymatic Traction”TM is the self- regulating speed governor feature of EVAC+CHAIR that enables the operator to speed up, slow down or stop on the stairs with smooth assurance and ease. Since its introduction in 1982, EVAC+CHAIR® has gone through 5 major design revisions with minimal weight increase and little added complexity for major evolutionary improvement. For these reasons, EVAC+CHAIR®has remained the standard for building evacuation of the disabled since 1982.